Seahawks have already taken a hard hit at the right cornerback spot, losing the two vets who had been expected to compete at that position. The Seahawks have placed cornerback Dontae Johnson on Injured Reserve, according to a report from Tom Pelissero of the NFL Network, and have replaced him on the 53-man roster with Akeem King, who was promoted from the practice squad. Johnson had been expected to start Sunday against Denver until suffering a strained groin in practice this week. He was listed as questionable for Sunday’s game on Seattle’s final injury report Friday. But it apparently is a more serious injury and Johnson now will be out at least eight games. Teams can recall two players a year from IR after eight games but no longer have to designate those players ahead of time. Without Johnson the Seahawks are likely to start rookie Tre Flowers at right cornerback. Flowers, a fifth-round pick from Oklahoma State, was a safety primarily in college but has been making the transition to corner. The addition of King, though, gives Seattle another option. King played throughout the preseason and some had thought he had a chance to make the 53-man roster. King has some experience having played in five games with the Falcons in 2015. The Seahawks have also listed Neiko Thorpe as a backup at that spot. But Thorpe battled a wrist injury and did not play in the preseason, though he said this week he is healthy and good to go now. Seattle’s other corners are Justin Coleman, the starting nickel, and Shaquill Griffin, who starts on the left side. 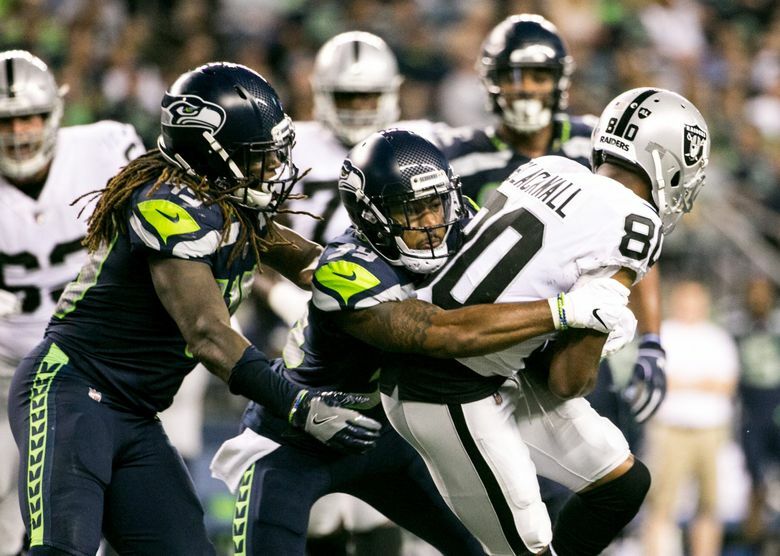 Seattle could also consider starting Coleman at RCB and then bringing in another corner in nickel situations, ala what the team has done in the past with Jeremy Lane. The Seahawks went into camp expecting that Johnson would battle with Byron Maxwell for the starting RCB spot with Griffin having been moved to the left side. Johnson started 16 games for the 49ers last season at RCB. But he suffered a foot injury that required surgery in the offseason and missed much of the offseason program and was limited early in training camp before starting the final two games there. Maxwell, meanwhile, never got in the competition at all as he was absent for the voluntary portion of the offseason program and then missed all of the preseason with a groin injury. The Seahawks on Friday reached an injury settlement with Maxwell making him an immediate free agent. But Maxwell could not return for the Seahawks for whatever the length of the settlement (which was not revealed) plus an additional three weeks. Seattle on Friday also waived cornerback Simeon Thomas off the 53-man roster, a move that appears designed to open up a spot for Earl Thomas, who has to be activated by Saturday afternoon to play Sunday against Denver. It’s thought Seattle hopes to get Simeon Thomas back on the practice squad.